A mad fun week packed with outings! So here we are another Fabulous Friday Fun and because we were having a South African Flavor Week I promised a South Flavor GiveAway… read on, read on!!! 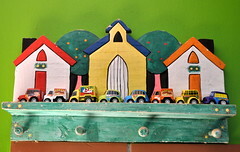 10 Crafty Blogs we love from Apartment Therapy: What can I can say… lots of inspiring things to look at!!! Pioneer Woman’s Crash Hot Potatoes: We are eating these at almost every meal… a very kiddable recipe – who wouldn’t want to crush a potato and yummy, crispy delight!!! The most stunning, cutest valentine bunting I have ever seen, head over to Whip Up. Lot’s of Organizing Links from the I’m an Organizing Junkie: Ooh, if you would rather be reading than doing then this is the spot for you, hints, tips and strategies for dealing with your stuff – love it!!! 8 Ways to Make Valentines Day More Meaningful For Your Family. Just taking the event beyond the “I love you so much that I have to buy you something sentiment.” And who wouldn’t want that!!! More Than Words: Simple Ways to Show Your Kids You Love Them from Simple Kids is in the same vein. Gotta chuckle at the “sing to your kids” suggestion… Hood #1 very crispy and clearly at nine months old uttered his first sentence: “Mam, Please don’t sing.” Clearly not all children love the sound of their mothers voices!!! Click to see my favorite, most energetic, photograph of the week: As simple kids and simple mom became simple media by adding simple homeschool, simple bites and simple organic to their repertoire. I just can’t wait to read more!!! We were on Whip Up with Se7en kids bags We were on Whip Up – gotta love that!!! Thanks Whip Up for linking us!!! And then we were on Space Jnr as well. And Sycamore Stirrings liked Hood #2’s Pocket Bag. I totally love Sycamore Stirrings – a diary of a family living in Luxemborg. I don’t think I will ever stop being surprised at who links up to us, and what amazing new “faces” you meet as you get linked away!!! So – did you have a ‘proper’ natural labour? This was in our local paper and I just had to comment, but of course there was nowhere to comment in the local press. And that doesn’t mean I don’t have an opinion. So here we go: Firstly this article assumes that most women don’t actually want natural childbirth and those that do are quite insane and have been hoodwinked by “the nature junkie police.” And the comment that …”This pressure to have a baby ‘naturally’ is strengthened by the National Childbirth Trust (NCT)…” Maybe the NCT should talk to local medical insurance companies that totally happy to pay every cent for a planned C-Section: pediatricians, surgeons, and so on, but not a penny towards a planned natural home-birth with no intervention and no complications… Somehow I think that the NCT may well be saying one thing and doing quite another. Not to mention that they certainly aren’t putting their money where their mouth is. 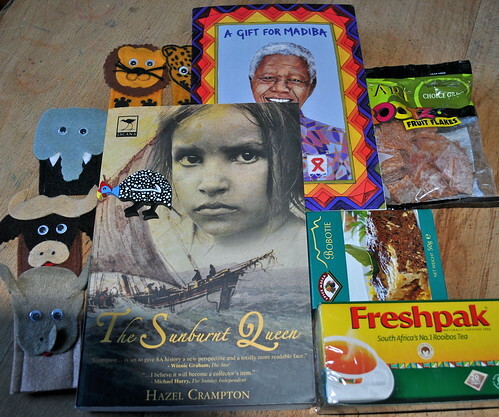 There is a grown up book, The Sunburnt Queen, a Madiba book for kids, some Bobotie Spices, rooibos (local) tea, dried fruit, finger puppets, a guineafowl magnet… Hope you love it! So link up or comment before the end of Friday this week, 19 February 2010, and we will draw and publish the winner next week on Fabulous Friday Fun – I may not respond to your comments as I do on our other posts because I don’t want to be included in our own giveaway. But I do love and appreciate every single one of them. Please enter me into the drawing! Love your blog! This giveaway looks fabulous! We just watched a video on South Africa which made us want to visit! You live in a beautiful country! Pick me! The kid’s would LOVE that! Oh, I found it very intresting to read your oppinion about natural childbirth. Overhere this is an issue too. About 45 % of the births take place at home, with a midwife and nurse to help. All paid for by your inssurance and a little bit by yourself. I did four home-natural deliverys and they all went fine and peaceful. I love it! But, now the healthpeople want people to go to a hospital too as this pays better and will decrese childdead. Maybe..but I don’t trust this. Although the healthcare overhere has a perfect high standard, all people I know that deliver in a hospital, got some infection. Or another complication… I think it’s better at home when mother and child are in good health. Oh, and I love to enter this special give away! I know that you speak some kind of old dutch language overthere. So, please, count me in too… Maybe you can read my blog in dutch? Please give it a try. Otherwise, I have a translation by google aplied on my blog..
Have a lovely day, all10 of you, greetings from mama lieveheersbeestje. Please add us on your number board game! Hi K, Thank You so much for linking again – love it!! !